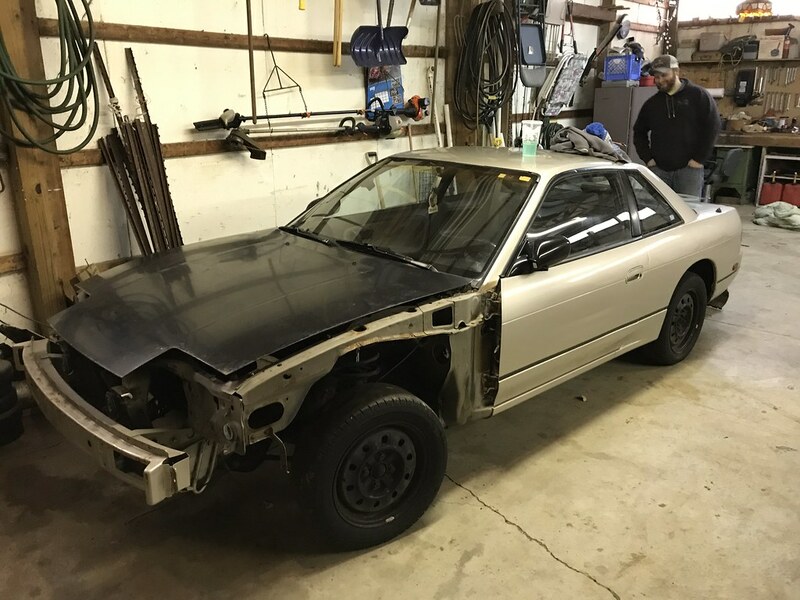 While on the subject of unwavering passion for S13, it’s no secret that I have had a strong desire to build a coupe variant of the chassis (often referred to as the PS13) for the last couple of years. I wasn’t too fond of them compared to the fastback/180SX variant when I first had a desire to own one of these cars years ago, but the desire to try my hand at building one has been growing. I always felt that the Silvia just looked a lot less exciting than the 180SX, especially when equipped with their respective OEM Nissan factory optional aero setups. But as I have gotten older I have grown to respect the relative simplicity of the PS13 body. I’ve had the pipe dream of building a second S13 chassis for a while now. “I’ll get a chance to do that when my house is paid off in a few years or after all of my girls are away at college,” I often tell myself. This thought is immediately met by an overwhelming sense of dread and urgency when thinking about just how hard it will be to obtain a decent rolling chassis to begin a build from in those 7-10 years. Surely all of them will be rusted out or crashed beyond repair by the time I am ready to build one, right? A photo from the for sale listing. I always keep my eyes open for deals and opportunities with buying and selling parts that might be beneficial to me. My budget at home is tighter than ever these days with me being the sole member of the family going to work each day, so finding deals occasionally allows me to put a little extra cash in the bank- or into my car. My good friend Tim that is building this red 240SX I shared a while back has recently grown a bit tired of trying to complete the car and has taken an interest in drifting. 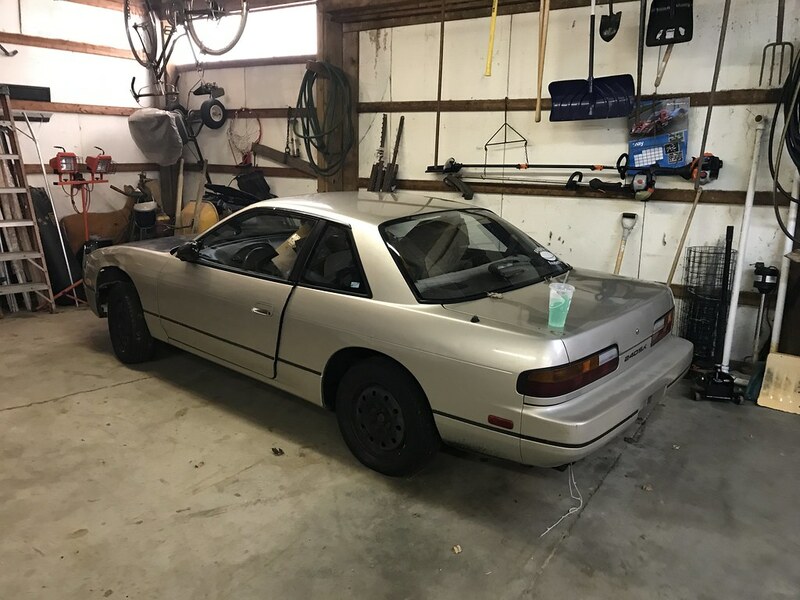 He picked up a rough looking 240SX coupe shell a couple weeks back to use as a drift beater but needed to find a KA24DE engine or two for it to get it running and on the track. The car and truck were both loaded to the brim with spare parts. While browsing the 240SX Facebook for sale pages, I came across a beige S13 coupe for sale in Indiana. The owner had purchased it a while back from someone in South Carolina and began tearing it apart to build it, only to lose interest along the way. He had collected a decent amount of spare parts for it including two KA24DE engines and a manual transmission swap. 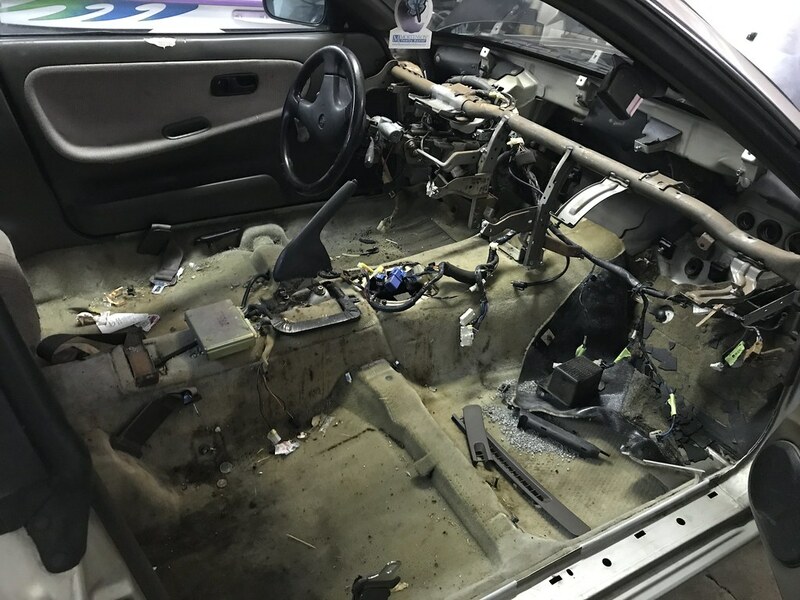 His asking price was much lower than the sum of the parts he was selling and his main stipulation with selling it was that whomever bought it had to take everything with them- the chassis and the entire pile of parts. I sent the link to Tim and told him we might be able to end up with a couple of free engines and a free S13 rolling chassis if we played our cards right. I decided I would buy in and help by selling all of the parts if (and only if) the chassis checked out to be as clean as the seller described. Tim ended up driving down to Indiana and bringing everything home to his barn. The chuki popup front end was stripped and sold as I won’t have any use for it. I wasn’t available to drive out to his parents’ barn where the car and all the parts have been stored until a couple of weeks later, but I spent the day going through everything with Tim last Saturday. We took inventory of everything we had with the car, which items each of us would want to keep, and what we could sell to get our money back. I spent the day taking photos of everything and hauling as many parts home with me in my Pontiac Vibe as I could to begin getting everything sold. I’ve been working on this through the course of the week and am pleased to report that I have now sold enough items to have this bare-bones chassis at a total investment of $0. As for the car itself, it’s in much better condition than I had anticipated. It’s definitely my least favorite color for an S13, but beggars can’t be choosers right? The car was bone stock before it was taken apart and has not been modified in anyway. 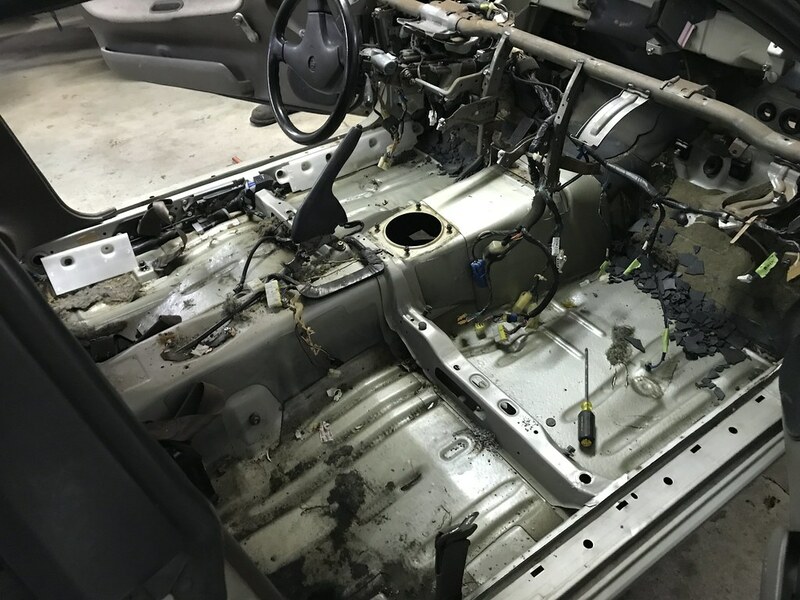 When removing the gross old seats and carpeting from the car, it appeared that none of the interior panels had ever been taken out before- very cool. 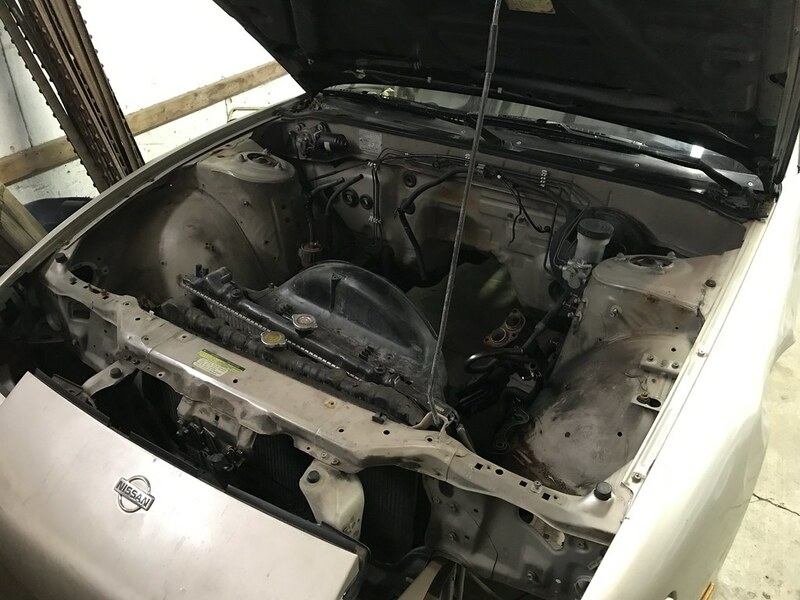 I checked each major area that is known to rust on these cars and was consistently surprised with the condition of each- the spare tire well, floorboards, rocker panels, rear fender wells, and frame rails are all free of rust of any kind. The rear quarter panels have not even been rolled! Here you can see the area of rust above the frame rail that needs to be addressed. This is just about the only rust on the entire car. It even still has the stock exhaust! The only area of rust on the car is in the engine bay below the brake master cylinder along the frame rail. This area will need to be cut and patched properly to remove the rust- just like I needed to do on my current S13. There’s also a very small spot on the passenger strut tower that would also need to be addressed. Pretty funny since both of these spots were areas I fixed on the black car when I painted the engine bay. The body definitely has its share of dings and does have a decent dent from dragging along something in a parking lot on the driver’s door, but it really is in remarkable condition for being a 1992 Nissan with over 300k miles on the chassis- especially considering the price. So what’s the plan for this second S13? That’s a great question. My wife and I had a lengthy discussion about the idea of keeping it set aside for when I have the means to build it up, but the size of our garage presents a storage issue. Tim and his parents were gracious enough to allow me to store the car in their barn for the winter, so I should be all set with that until March or April of 2019. I’d really like to bring the car home to my house for the spring and summer months of next year to tinker around with it and clean it up a bit, but we’ll see what happens. When winter arrives next year I would either need to move it somewhere else or find another place to store my current 240SX on the cheap. We’ll see what happens. Nasty beige carpet and seats removed- looking better already. The chassis was originally an automatic transmission with brown interior, so my first order of business would be to alleviate those issues. I have a number of black interior panels from my own car and that were included as spare parts, so I actually have a pretty good start on converting the interior to black. The car also included manual brake and clutch pedal assemblies, so I can drill the hole in the firewall for the clutch master and install those items too. If anything, converting the interior to black and setting up the chassis for a manual transmission will likely increase the value of the car, so I’m not too worried about putting in the effort to accomplish those things should I decide to sell the chassis later down the road. 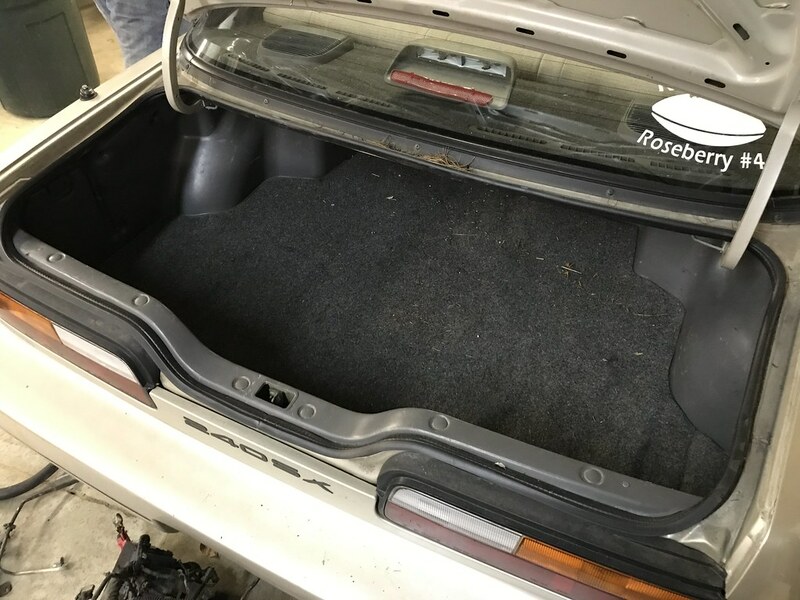 At least the inside of the trunk looks presentable. If I do end up deciding to keep this car around, the build won’t be remotely like the pace of my current car. Life looks much different these days and I simply do not have the means to build a second car, as much as I would love to. There are very simple tasks that I could take on to clean it up and prepare the car for the future though that would keep me busy and bring me some enjoyment. I also have a number of spare parts from my current car that I could use to partially assemble this one. We’ll have to see what life throws at me to determine how I proceed next, but I am excited about the possibilities. Fingers crossed that I can one day join the ranks of those that have a nice, clean example of both variants of the S13 chassis in their garage. Thanks for reading- feel free to drop me a comment or email any time if you have questions! Happy to read that you finally got a Coupe, and damn, for free! What a great score! In my country there aren’t much S13s to be found, but unlike the US, all of them are rust free (no snow here), and the vast majority are fairly stock. Also, around 70/80% of them are 200SX (but in reality, 180SX, they have the CA18DET), and the rest are 240SXs. No SR20s down here. What really bugs me is our stupid economy where used cars keep going up in value, regardless of the make and model, and, sporty cars like this, even more.To give you an idea, there are only three for sale now… What are they going for? 11,5k, 12k and 17k. LMAO! I guess what I’m trying to say is, I know how hard it can be to be the sole income of a family, but at least in the US, it’s easier to find cars for cheap (or less! Lol), and at least have a go at wrenching! Don’t get discouraged if some time goes by and you don’t see progress with this one, or get the other one painted. 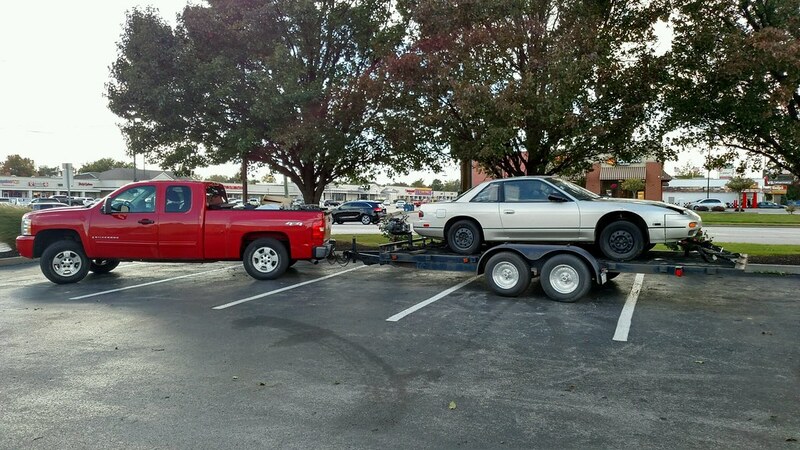 Hang in there, do as much as you can yourself, and enjoy your dream of owning 2 S13s! Keep it up! I don’t usually reply to your posts, but I read them all! Thanks for the kind words and support! Very fortunate to have found this chassis for sure and I hope to be able to fully save it and realize my vision for it someday! Definitely trying to hang onto it though. And yes, I would LOVE to have a lift in my garage so that I could store both cars! Maybe someday, haha. Getting a comment from someone in Argentina is super cool- I appreciate it! This is awesome. Keep it! You’ll hate yourself late if you let it go. Who cares if it’s a lengthy build but that’s what makes the end result the greatest, the journey ! I’m sure you are right, haha. And I agree! I need to take my own advice sometimes as difficult as that may be. Thanks for the comment!